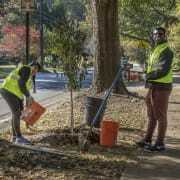 Every Saturday from 9 AM to Noon join Trees Atlanta in planting and taking care of young trees all over Atlanta. Create a volunteer account to get more details by visiting www.treesatlanta.org/volunteer. We send out weekly emails that announce upcoming projects. No prior experience is necessary - Trees Atlanta will teach you what to do. Tree Maintenance projects (April-September) are best for ages 12 and up. Volunteers under the age of 16 must be accompanied by an adult. Volunteers between the ages of 16 and 17 who are not accompanied by a parent/guardian must have a parent/guardian sign a waiver for them (this form can be downloaded from the Trees Atlanta website - go to www.treesatlanta.org/volunteer and expand the Saturday Projects heading). Physical activity such as bending, lifting, and kneeling is required. Projects happen rain or shine, so please check the weather beforehand and come prepared. Trees Atlanta will provide all necessary tools and instruction. All volunteers need closed-toed shoes or boots, clothes that can get dirty, sunscreen and bug spray as needed, snacks as needed (though a meal or snack before the project is recommended), and drinking water in reusable containers. No one-time-use plastic bottles, please.